ABox - File Packer, is a lightweight, and flexible application that lets you quickly and easily compress and decompress files and folder trees to save storage space, reduce e-mail-transmission time or protect sensitive data using the encryption and decryption features. There are plenty of solid compression utilities to choose from, but this freeware powerhouse offers the features and ease of use that place it at the top of the compression category. ABox, a new step in the evolution of compression utilities. Lightweight application that requires no installation, single executable file with really low memory usage. 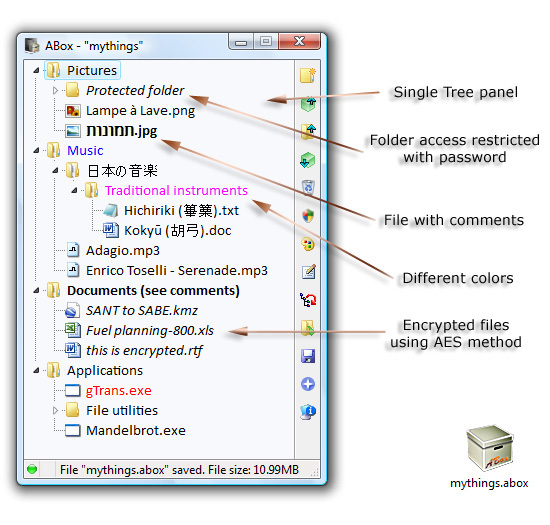 Tree panel displaying files and folders combined into a single view. "Find" option that lets you easily locate files and folders. Perform interesting operations on files and folders like add individual comments, change the name and color, etc. Change the location of files and folders within the tree with drag-and-drop. Add new files and make all kinds of changes quickly and easily, and store those changes only when you press Save. This is useful when making changes to large files because you do not need to spend time waiting for the changes to be set for each step. The changes that not involve update in already stored data is saved quickly. Secure sensitive data using strong AES (Advanced Encryption Standard) encryption. 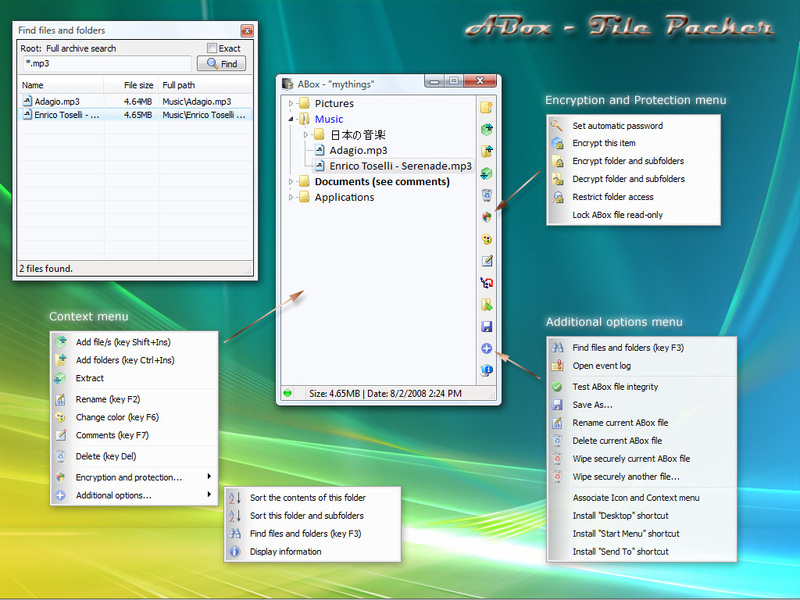 Block the access to certain folders with password (data not encrypted). Perform useful operations on open ABox files, like test integrity, rename file, delete or wipe securely. "Wipe Securely" option that lets you destroy ABox files securely (the application automatically wipes temporary copies of encrypted files after viewing them). "Automatic password" option that lets you automatically encrypt/decrypt files using the same password when you add or extract them. "Lock ABox" option that lets you make "read-only" an ABox file. Automatic file update after being edited. Create new folders inside of an existing tree structure. 100% Unicode compatible, enables users to load files with names in Chinese, Japanese, Korean, Russian, etc. ASCII, UTF-8, UTF-16 Little-Endian, UTF-16 Big-Endian, UTF-32 Little-Endian. This software is digitally signed with an Authenticode Certificate to ensure its integrity and authenticity. Windows is a registered trademark of Microsoft Corporation.